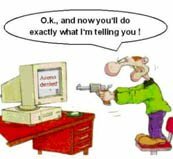 I’m sure you will be asking yourself what in the world has computer lessons for seniors got to do with manners and etiquette? Well let me explain, I feel our seniors are being neglected by all and sundry. As people pursue their own interests, work and family, their parents and grandparents are pushed more and more into the background, the ‘too hard’ basket, ‘things to do’ list. More and more we see evidence of the younger generation being caught up in the hustle and bustle of their busy lives. They just cannot possibly spare the time to give of themselves to their elderly parents, no matter how good their intentions are. Sometimes this neglect is due to a lack of time, sometimes it is a lack of manners and etiquette, but mostly it is ignorance of their parents’ lack of computer literacy or of knowing how to access our Computer Lessons for Seniors. You know you need to be doing more, but you also know you just cannot manage the time. You decide to give your mum and dad your old computer so that they can keep in touch with their friends and family who live too far away to visit. That will stop them from feeling so lonely. That is very kind and generous of you. But now you do not have the time to show them how it works. After all, it takes time and patience to give computer lessons to seniors. We owe so much to many of the older generation, so, we should help them as much as possible where we can. One of the ways to do this would be to help them to maintain their independence and self-reliance. However, I’m not sure that you are aware that your kind deed was not so kind after all. What you have achieved here is to give your parent a whole lot of stress, frustration and guilt! Guilt because they want you to know they are grateful that you thought of them … and guilt! Guilt because now they could cheerfully STRANGLE you (smile). They are so stressed because they do not even know how to switch the darn thing on! They NEED computer lessons. They are really afraid they will mess it up and you will not be happy ….. I could go on about this, but it is enough to say they are positively TERRIFIED of the love gift you gave to them. What to do about this catastrophe? Easy peasy, lemon squeezy! You can seek help from some of the sponsors listed at the top or right side of this page. Check them out. Better still just click on the Free Computer Tutorial link on the right to view your fantastic FREE lessons. Now all you have to do is to print it out in full color and hand this easy, step-by-step tutorial over with your magic gift. This basic mouse skills lesson is invaluable! You have nothing to lose, but heaps to gain. Or maybe you would like to learn to have some fun on the Internet? Ah, I knew there was something I could interest you in. 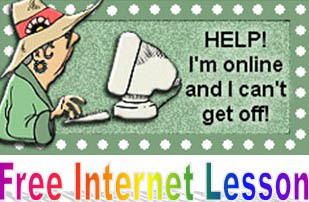 All you need to do is click on the FREE INTERNET LESSON graphic below for your free trip on the Net. Unable to view it? You will need the latest version of Adobe Reader installed on your computer in order to open and read this absolutely FREE lesson. If you do not have it, just click on Adobe Reader to download this wonderful tool. It too is free of charge. This must be your lucky day! (smile). 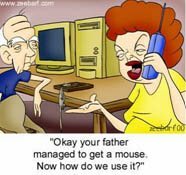 But if you REALLY want to help your wonderful parents or lucky senior, why not print several lessons from the Computer Lessons for Seniors listed below. They also are ALL absolutely FREE. No gimmicks, no tricks. I promise you the lucky recipient of your gift will never, ever bother you to help them again, they may even teach you a thing or two, especially if they get carried away with their enthusiasm and decide to Build a Website of their own (smile). These computer lessons for seniors have been taught in Western Australia at schools, retirement villages and community centres. They have been tried and tested by hundreds of seniors. Now you can look through the rest of our Computer Lessons for Seniors to see what else you can give to your lucky parent. Selecting your next computer tutorial and downloading it is easy. Just click on the appropriate link below. It will download right away and appear on your screen for you to use over and over again. - Has more than 530 pages of everything you wanted to know about Computers but, felt too embarrassed to ask. - Provides self-help for the absolute beginner to the more advanced user. - Is also an ideal teaching aid for XP & MS Office 2003. - Is written in an easy style with lots of illustrations and good humour. - Incorporates all the above lessons plus much more.